My whole problem can be blamed on two things. One, “The Element Encyclopedia of Magical Creatures” by John and Caitlin Matthews, and two, those aardvarks are cute little devils. Care for me to expand on this? Here we go. Each month I try to write about a creature of legend, religion, or myth. I have talked about demons aplenty, spirits to spare, and a few cryptozoology favorites too. When trying to decide what to do for this month my husband said, “The aardvark.” “Huh?” was my reply. At which point he told me to look up the aardvark in the before mentioned encyclopedia. Well, I was happy as a schoolgirl. John and Caitlin explained to me that the aardvark, in African folklore, is admired because of it’s diligent quest for food and it’s fearless response to soldier ants. More importantly, at least to me, they told me that Hausa magicians make a charm using assorted aardvark bits pounded together with the root of some tree. This aardvark charm gives the owner the power to pass through walls or roofs at night. The Matthews’ go on to tell me that this charm is frequently worn by burglars and spunkily enough those seeking to visit young women without their parent’s permission. Hot damn, this sounded fun! I looked through a few other books I own that I thought might reference the aardvark but found nothing. Undaunted I turned to the World Wide Web. Obviously, Wikipedia’s entry for the aardvark popped up first thing. I doubted I would find any mention of the magical side of the aardvark, but I figured I should check out the mundane mammal. There he was, the cutest little guy you could ever hope to see. The adorable aardvark. Oh, he is so cute! Now I was good and truly pumped, I had my mental checklist, aardvarks: cute, use their bits to make sneaky charms. How cool! I began searching. I tried dozens of different keyword searches. 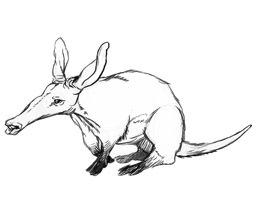 I check out African folklore, Hausa, magic, magic with a k, all with aardvark. I get nothing of note. Sure, I find a couple of websites. One site actually had the scanned page from the book I had! At least they were more honest than another site, where a woman posted almost the exact words from the encyclopedia’s entry but passed them off as hers. Since her name wasn’t Caitlin Matthews, I don’t feel she was entitled to do that. This was a problem. Um, where was the article I was intending to write going to come from? Sadly, I realized there wasn’t really going to be one. So what am I saying? I am saying there is a reason that there are John and Caitlin Matthews’ out there in the world. They put in the time and effort and they come up with aardvark bits being used to make magical charms. (By the way, aardvarks are nocturnal, so that’s probably why the charms only work at night.) I am a generalist, and perhaps a lazy one at that. I put in my time and come up with aardvarks are pretty darn cute. Not much of a column is it? Here it is nonetheless because I think aardvarks are cute, and the Matthews’ told me Hausa magician’s use aardvark bits to make magic charms.